I found this stencil by world-famous graffiti artist Banksy plastered next to the rear entrance to Camden market today, and couldn't resist taking a snap oif it. The guy is a genius. Banksy seems to be Britain's self-appointed answer to Haring who also started out with graffiti defacements. Unfortunantly Haring was a careless active homosexual who died of AIDS. Apparently Britain's self-appointed answer to Haring who also began as a graffiti defacer. Unfortunantly Haring was also an active homosexual and died of AIDS. 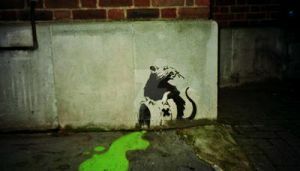 I love Banksy so much, we're studying him in art at the moment, he is indeed a pure genius! Would you mind if I use this pic in a Graffiti collection?? A famous British graffiti artist. Lol, it says "Sup Yanks." Banksy is an artist, some "Graffiti Artists" are idiots and hoodlums who think it's cool to draw penises on walls, banksy on the other hand makes perfect street art, but he does not actually exist. Banksy just is. I saw his 'movie' today; 'Exit through the giftshop'. I LOVE Banksy hes my favourite artist I got his book yesterday! It awesome! BANKSY - YOU ARE THE BEST !! Banksy?! man, i love that guy!! we have to do homework based on our favourite artist - this was the first name that came to mind for me and i'm loving my work so far. You can't beat a bit of Banksy. My husband and I went to see his exhibition in Bristol last year... great!!! He's simply amazing! I love the one with the tropical paradise (in israel, i think?) I watched the movie 'Exit through the Gift shop' and it had him in it.